This is a big world, we happen to have been born into a dominant country, itself part of a prosperous and powerful Western civilization. We're "oversupplied" with news though it may not inform us well. "Six stories from seven continents" is a modest effort to remind ourselves there are snippets, events, and stories from all around the world to hear and learn from... that our awareness is incomplete, and life is breathtakingly more complex and wonderful than we usually imagine. The always bombastic and unpredictable North Koreans go hysterical again. This time the country is prepared to "go to war" with South Korea because that country is playing loudspeakers directed at North Korean territory. A headline from a UK paper reads, "More than 50 North Korea submarines 'leave their bases' as war talks with South continue "
In France, a killing spree that was at first attributed to neo-Nazis, ended as one of the country's first examples of a "lone wolf" Islamic extremist. One direction led to a large story of Nazi-ism, France's Vichy government in World War Two, and Europe's perpetual wariness of that doctrine raising its head again, even as an underlying level of anti-semitism remains. The other direction, which turned out to be correct, is of a young man raised in France, but subverted and indoctrinated in some manner from extremist websites to become a profoundly confused and destructive terrorist. The story remains confusing on a few levels, but was consuming enough in France to possibly have changed the direction of an election in one month's time for the Presidency. Mohammed Merah, 23, first fatally shot three soldiers last week in two separate incidents, and four people at a Jewish school on Monday. 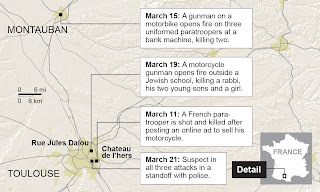 After a massive manhunt, he was cornered in a second story apartment in Toulouse, the large French city where all but one of the shootings occurred. After 30 some hours of negotiations, Merah at some point attempted to escape, or at least came out of the residence, and was killed in a hail of police bullets. Map showing location of Toulouse in southern France, and the incidents, all in or near that city of 800,000 which is home to a large North African concentration of about 75,000. When the unknown gunman (Merah we know now) attacked a Jewish School in Toulouse on Monday this week, the possible anti-semitic motive and ties to neo-Nazism could still be in play. But the brutality of these killings, which included three small children, and one of those deliberately sought out and killed up close, repelled the nation, and the manhunt frenzy was on when police realized they had a serial killer on the loose. Once cornered, Merah apparently held several conversations with the police negotiators, and word began to spread that he was a French national of Algerian origin who spent considerable time in Afghanistan and Pakistan two years ago. 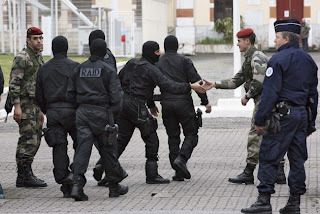 At one point, France's Interior Minister, who was by then on the scene where Merah was surrounded, told reporters, "He claims to be a jihadist and says he belongs to al Qaeda. He wanted to avenge the Palestinian children and take revenge on the French army because of its foreign interventions." Over 300 French security personnel from various branches converged and deployed on the apartment when Merah was cornered. In the aftermath, an investigation was begun into the situation, as Merah it turns out had been monitored at some level by French intelligence for some time, and was already on a US no-fly list. Was he acting alone (the story of a home-grown lone wolf extremist is chilling as a threat difficult to counter and one that invokes the horrific Norwegian violence last year when Anders Brevik shot and killed over 70 individuals, mainly teenagers at a youth camp). At the same time, reports were that Merah belonged to a group called Forsane Alizza, or Knights of Glory, according to the Interior Minister. Gueant said that the French government banned the group in January for trying to recruit people to fight in Afghanistan. 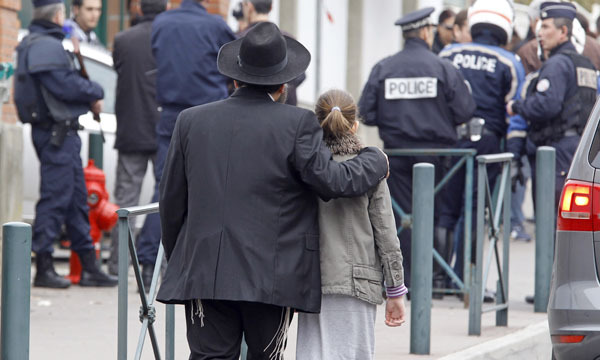 Before it was banned earlier this year, the group issued a "chilling warning" on its Facebook page , calling on supporters to attack Americans, Jews and French soldiers ... So competing and incomplete narratives are out there, and will still need to be sorted through. Meanwhile, the contest for the French Presidency, which was suspended for several days, continues, with current President, Nicolas Zarkosy, suddenly propelled back into a dead heat with Socialist candidate, Francois Hollande. According to one political observer, "Three years of economic gloom, and a personal style many see as brash and impulsive, have made Sarkozy highly unpopular in France, but his proven strong hand in a crisis gives him an edge over a rival who has no ministerial experience." Mr. Sarkozy announced a crackdown on people following extremist websites. "From now on, any person who habitually consults websites that advocate terrorism or that call for hate and violence will be punished," he said in a statement. "France will not tolerate ideological indoctrination on its soil." French 17th Parachute Engineer Regiment paratroopers carry the coffin of their comrade Abel Chennouf during his funeral near his pregnant companion Caroline Monet. She will be allowed to marry him posthumously. 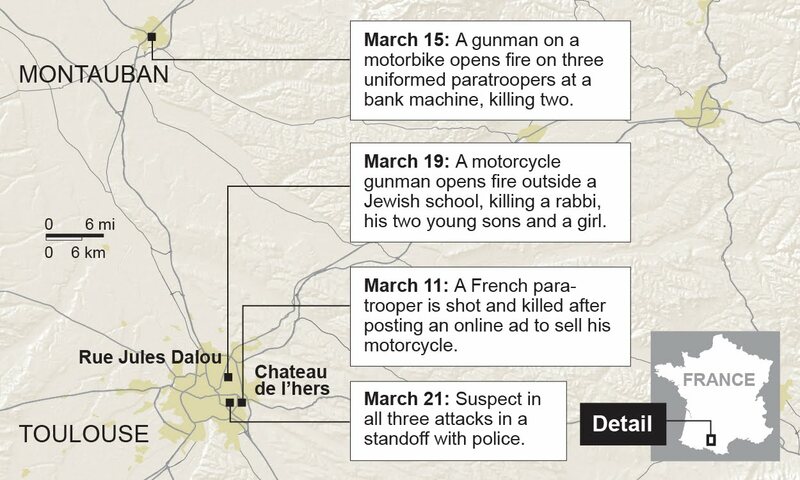 In contrast to the worldwide attention to the Toulouse shooting spree (as well as the tragic shooting of 17 Afghanis by an American soldier, and the killing a month ago of a 17-year old African American youth in Florida that was not investigated until just the past few days) reports of another that occurred this week is likely to pass with little text. Al-Qaeda's Yemen branch said Thursday that it killed an American teacher because he was trying to spread Christianity in the mainly Muslim Arab nation. Joel Shrum, a 29-year-old native of Mount Joy, Pennsylvania, was gunned down on Sunday in the central city of Taiz, where he had been living with his wife and two sons. He was studying Arabic and teaching English at a language institute. Joel Shrum - a 29 year old. As related in a USA Today story, "It was God's gift for the mujahedeen to kill the American Joel Shrum who was actively proselytizing under the cover of teaching in Taiz," said the statement by al-Qaeda in the Arabian Peninsula, as the terror network's Yemen branch is formally known. A text message that circulated by mobile phone in Yemen after his killing said "holy warriors" had killed "a senior missionary" in Taiz, the country's second most populous city after the capital Sanaa. The slain teacher had worked at the International Training and Development Center, which was established in the 1970s and is one of the oldest foreign language institutes in Yemen. Yemen in the throes of factional fighting, a result of an un-responsive and corrupt government over the years, and threatened by an opportunistic branch of Al-qaeda. Shrum's parents, who reside in Harrisburg, Pennsylvania, say he went to Yemen in 2009 to learn Arabic, not to proselytize, and became passionate about teaching business skills to Yemenis. A colleague at the language center, who spoke on condition of anonymity for fear of reprisal, said Shrum used to encourage Yemenis to stay true to their Islamic faith and did not try to convert people to Christianity. He said Shrum not only taught Yemenis English, but would often buy students books and assist them in learning computer skills. Hundreds of youth activists and other protesters marched Tuesday through Taiz demanding justice for the Shrum. They carried photos of Shrum as they marched through the city's streets, chanting, "Yemen is not a place for terrorism. We love you Joel!" In contrast to the emotional support for Joel Shrum from Yemen's youth, a typical picture of malevolent Islamists and their guns. Background for my offhand reference to "competing narratives" in regards to how the Merah killings will eventually be framed. Here is a haunting example of another narrative, taken from a 1946 documentary on World War Two. A British army officer recounted a conversation with a German woman amid the ruins of her bombed and blasted German city as Allied Forces swept through on their way towards Berlin as the war's end was nearing. Pointing to the destruction around her, she said, "If only you had given up in 1940, none of this would have happened." Starting with the last first. I'm gettin' old, moved a lot after the first 22 years, lived in East Africa for a tremendous 4 years, find myself in a wonderful family - spouse, 2 daughters, son, daughter and son-in-law, three granddaughters, and one grandson. I hike and bicycle to resist sedentarianism. The blog has a simple mission - keep one daughter in particular informed a bit more as to what's goin' on in the world of events, incidents, trends, and forces - some might think of "principalities and powers." She lives in a world of creativity, painting, and culture but would like to be more conversant with the other. We're working out an exchange.